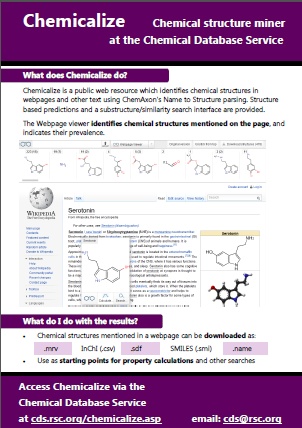 Chemicalize is a public web resource which identifies chemical structures in webpages, pdf files and other text using ChemAxon’s Name to Structure parsing and indicates their prevalence. Chemical structures mentioned can be downloaded as .mrv, InChI (.csv), .sdf, SMILES (.smi) or .name, and used as starting points for property calculations and further searches. Watch an introductory webinar to Chemicalize here. Thank you to Andras Stracz from ChemAxon Ltd. for presenting a webinar discussing the possibilities of Chemicalize . A series of free webinars over the summer will provide an overview of the various resources served up via the National Chemical Database Service. Please watch / register for the webinars by clicking on the links below. The webinars will be followed by an opportunity to give feeedback and ask questions. All webinars will be made freely available after the event. You are currently browsing the archives for the Chemicalize category.